A technology transfer project for the Regione Toscana in order to provide a solution to predict the effects of geothermal power both in the same basin and the surrounding environment in some areas of Tuscany. A web application in a GIS environment is designed and developed in order to visualize and query simulation data and their scenarios stored in a geospatial database. 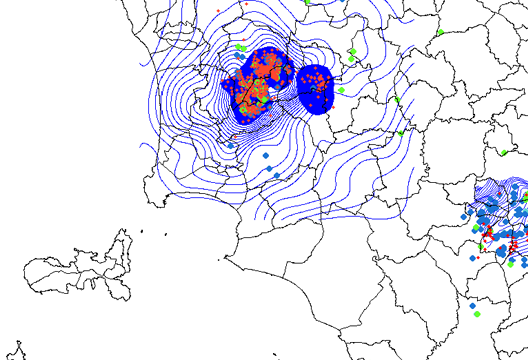 The MAC-GEO project aims to give the Regione Toscana some simulation tools to predict the effects of geothermal power both in the same basin and the surrounding environment. The project was funded by Regione Toscana CIPE funds, following the announcement Framework Programme Agreement Research and technology transfer for the production system – Supplementary Agreement III. The project started in September 2008 and lasts two years. MICC research staff designed and developed the Geotherm Viewer, a web application in a GIS environment for viewing and querying simulation data and their scenarios stored in geospatial database. The system was designed for users who need to quickly view the results of the generated simulations in order to assess which groups of data for later analysis and deepen the effects of geothermal both in the same basin and the surrounding environment. In addition, the user-interface provides a set of interactive features for geographic data visualization, data from web map services and information generated by Google Maps. The Geotherm Viewer has been developed with open source technologies. This entry was posted in Internet applications, Projects, Transfer projects and tagged data-visualization, geothermal, GIS, Tuscany on March 25, 2011 by admin. 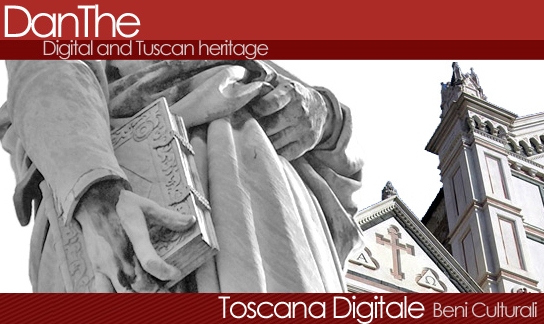 DanThe is an online service, developed and implemented by Tuscany Region and MICC – Media Integration and Communication Center – University of Florence, to promote the resources related to digital cultural heritage of Tuscany. DanThe provides a direct access to collections, databases, regional museums, libraries and catalogues of cultural heritage. The “catalogue of collections” provides a selection of the Tuscan digital documents (texts, images, video, audio) concerning cultural heritage (artistic, historical, archaeological, ethno-anthropological, archival and bibliographical). These collections were previously catalogued by the Michael Project (Multilingual Inventory of Cultural Heritage in Europe). Within the universe of European digital resources Danthe identifies a Tuscan subset of collections and make it accessible to different users. The “catalogue of cultural heritage” is designed to collect and make available descriptive and informative catalogue records – in accordance with local owners (municipalities, museums, institutions etc.) – and realized using the standards ICCD and the CART free software, produced by the Tuscany Region and carried out by the Scuola Normale Superiore in Pisa. In accordance with the guidelines of Michael Project, Danthe selected digital collections regarding people, works and cultural heritage of Tuscany, promoted, financed or produced by Tuscan institutions and regional offices of national or foreign institutions. The collections presented in Danthe, as those ones published on the European portal of Michael, are available online and/or offline, are free, or available on the registration fee and may be completed, planned or in progress. allow the use of such digital contents by the web interface unified Danthe. DanThe is part of a national strategy (portal CulturItalia) and (Europeana) which aims to combine and enhance digital assets in Europe, to consolidate descriptive standards and to set minimum standards in the development of resources of various nature and non-traditional format, generated using innovative technologies and for heterogeneous users. Because of the deep analysis of the existent carried on digital resources relating to cultural heritage, the European project Michael was the basis to fill and populate DanThe database. The close cooperation between national European project of Michael, the regional cataloguers and the editors of DanThe allowed to use the expertise and knowledge of the local census of digital collections and to personalize the presentation and the fruition of the digital resources themselves. Even though DanThe borrowed from Michael all the entities structured and divided according to the descriptive standard of the project, the Tuscany recourses are presented in a singular and personal way. In particular, it were not censed catalogues of libraries when they gave no services other than paper, to consider as digital collections not only the resources derived from analogical source (books, art works and objects of art, etc..) but also those formed from digital material (videos, Word documents, audio files, etc..) and to give a direct access to the collections online providing, where possible, the specific URL of the resource rather than to the generic website or the catalogue containing it. This entry was posted in Cultural heritage, Projects, Transfer projects and tagged cultural heritage, Tuscany, web interface on January 18, 2011 by admin.